1. Send me an email, with or without your image file, with any questions, or request for sample fabrics, etc. Then we can go from there. I do all details through email so both of us can keep record of conversations, and your requirements, and desires. If you are going to order more than one scarf I can let you know possibilities for saving costs. 2. If you need a quote because it is a custom size or not listed on the website, I'll get that to you usually that day or the next morning I can also give you a ballpark shipping date, and you can let me know if there is a deadline. 3. When placing the order, send the image file (see below) and tell me which fabric you want and verify the final print size and any instructions you may have.If it is a large file, you can utilize one of several online file transfer sites such as Dropbox, Google or WeTransfer. 4. I will get back to you to confirm or if more conversation is needed, by email . I don't list my phone number on this site because when it rings it often interrupts the printing for someone, and I don't hear on the phone that well. Give me your mailing address at the time of your order so I can calculate shipping costs, especially if you are international. On a rare occasion someone's Paypal address is not where you want the print sent or is an old address there. 5. Most of the time I will print within the next couple days - depending how many orders are in at a given time - or if I have to finish a large order of a different fabric first. Then I get it to the finisher for hemming. I meet with her 2 or 3 times a week and her time frame will depend how many scarves she has in queue at that time, and how many scarves in your order. Again, I will expedite if you need it by a specific date. 6.Then a Paypal invoice will be sent to you, where you can pay by credit card, or over time if you choose, whether or not you have a Paypal account..
7. Your prints will be shipped. I go to the post office twice a week to ship I use Priority 2 Day mail unless someone requests FedEx. I don't do UPS - the facility is too far from where I live. I print at 360ppi resolution, preferably with Adobe RGB and TIFF format. IF WHAT YOU HAVE IS A JPG, A DIFFERENT RESOLUTION, and you don't know what Adobe RGB is- NO PROBLEM. SEND WHAT YOU HAVE. PRINT SIZE; an image file can be scaled up to 4 times its original size. That equates to if your file is 8x10 inches, it will scale up to 16x20 inches quite well. But that 8x10 will look bad scaled up to a 36x36 inch scarf. Personal attention is given to your scarf at every step along the way. Your photos, paintings & designs will be printed as accurate color as possible. If you need an exact color match, send a small print on paper or swatch for us to match. Monitors and devices do vary in color and what you see may not be what I see or the printer sees. I don't do Pantone colors - they are for a different process like for a 4-color press or screen printed. As well, graphic vector designs with an over-all single color can be difficult to match if our monitors don't 'see' the same color. Sometimes people send a PDF file. These often work just fine, but know that it will be one more step to translate that file format to print and if color is critical to match, it would be best to send either a JPG or TIFF file. JPG files are very common. They are not the highest quality file format however, so a Photoshop PSD or TIFF is best for larger prints..
sRGB is also the most commonly used profile. I prefer to print ADOBE RGB for better color. If you are a photographer, send your ProPhoto images. I don't print from Camera Raw images - there are too many variables that need to be addressed in camera software first. The image below shows how much of the spectrum (rainbow) will print in the various print profiles. Don't send CMYK, that is for large press printing. 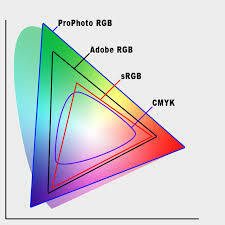 Printing is RGB through Photoshop. With duplicate prints, each print should be exactly like the last, but there can be nearly imperceptible differences which is what makes each an original work of art, not merely a replica. If you want to see what the scarf will look like - perhaps it is a composite or made into a repeat pattern - I can send you a digital file to look at before it is printed. Please don't ask for a photo of the scarf after printing - I don't have a studio set-up to take a proper photo on site, and a pix from the smart phone won't be accurate color. 2) Check the resolution of the file. I will need at least 240 ppi, preferably 360 ppi for a larger scarf. If, for reason of size, your message to me can't be sent email, send the message without the image, and send the image separately through a file transfer site such as Dropbox or We Transfer or Google. It is OK to put a large file into a zipped folder and it should transfer to me just fine by email. Be sure the image is flattened if you worked with layers. 4) Save as a high quality JPG format, or TIFF or PSD. TIFF is a better quality than JPG, but if you must send JPG, when you save it, do so at 12 quality, standard. I occasionally receive PDF files. If your original file is a high quality, high resolution file, the PDF you converted to should be just fine. I will have to change the PDF to TIFF or PSD in Photoshop before printing, which makes one more translation of the file and a small chance the color may shift a tad in the process. 5) Send RGB files not CMYK. I can convert, and the color is usually the same, but to be sure it is best if you do it so you can see on your monitor before sending. Changing file formats and profiles for printing can result in a color shift. 6) IMPORTANT - if you have a signature on the image, allow enough space from the edges to avoid having your signature rolled into the hem. Hems take about half an inch all around. For professional photographers, don't send RAW files because the third party program to open them may not keep all your work you've done on your software. ProPhoto is fine, and will be printed in ProPhoto format if I get it that way. ProPhoto has a larger range of color so excellent for the best photo quality. *As you know, all monitors are not created equal. Smart phones and tablets also vary in colors you see. Therefore the color calibration on yours may differ from mine, and what I see may NOT what you see. As well, PC and MAC can look a bit different in color. An older CRT monitor differs in color from the new flat screen LED or plasma. If you require absolute color match, send a color correct small print on paper in the mail. Keep in mind that a high gloss print on paper and the soft silk fabric will not be identical in color depth, even though both are accurate color, so a print on matte paper can be more helpful due to the reflective attribute in gloss paper. It is all in the perception. I will do my best to make it pleasing for you. My monitor is designed to replicate the exact color gamut that is in Photoshop. As well, my monitors are color calibrated at regular intervals. Again, if color is of utmost importance, send a small print in the mail to match colors. Note also that special requests may require special pricing over and above the print-as-is prices on the price list. I can correct 'boo-boos' on a photo (red eye, or blemish, or a perspective distortion from photographing a painting) or color correct - some of which are included in the price, others for a tad more $$. I can make most composites here - like if you want a long scarf from a smaller square image. I don't charge for that. But sometimes a complex composite is what people want and that can take time to do. Call or email me if this is your need. Love to help you achieve a wonderful print!! I can open AI files and export TIFF, but is best if you do that. Then you can double check how the color looks in Photoshop where it will be printed. Please don't send EPS files - they are for a different print process. And again, RGB is what will be printed. If your file is not too large, just attach the file to your email. If your email server can send the file, I can receive it. Some servers like Yahoo & Gmail have file size limits.You may need to put it into a zipped folder for a large file to email. Or use a file transfer site as noted. Sometimes I receive images which are just put into the body of the email. These images arrive without file names and usually are small files that can't be scaled up to the size you want to print. So, it is better to attach the file so I have the correct file name and type of file (like JPG as example). You can upload larger images in inches, and higher resolution, files to a site which in turn I can download here. These sites typically will store the file for a limited time, like two weeks, during which time a designated person can download from them. I have clients who use this service regularly. Very large files can be sent - I've received files well over 1G in size this way. One site is www.wetransfer.com. Another is www.dropbox.com. There are others, and I can't recommend one specific site as better than another. Google also provides file transfers. Be sure either the transfer site sends me an email link to your files, or you need to give me the link URL in an email so I can download. You can burn your images to a CD and send through the 'snail mail'. It will take a little longer for me to get it, but that is also a good way to get me your images. This method would be fine if you have very large files, or if you want a higher resolution. Feel free to send TIFF or PSD. The CD or USB drive will be returned with your order. If you don't have a clue what I just said - not to worry. Just email your JPGs and all is well. No 'examples' or images of your work will be placed on any website or used for any purpose other than making the prints for you. Nobody sees your art work except whoever prints it, and whoever hems it. We see so many and are artists ourselves so won't mis-handle your art. But we do enjoy your art! If, however, you would like to have a small copy of your work on this site - in a gallery setting - as a promotion of your work, and of your art, and a link to your own website - I would be happy to do so. Just send an email or let me know along with your order or later after it has been in your exhibition. If desired, Digital Silk can retain a copy of your image sent for the first printing to be used to print more for you at a later time. Unless you request this service, all CDs sent here to print will be returned to you - all digital files sent email or a file transfer site will be scaled down to a small thumbnail size for my records after printing. United States copyright law requires the person submitting an image to me for reproduction in any form must be the copyright owner or to have permission from the copyright owner to reproduce the image. I can't therefore print pictures someone has simply downloaded from the Internet and someone else holds a copyright on it. We do not publish or use anyone else’s art but our own on this website, nor do we show your files or finished work to anyone. As soon as your order is ready it will be shipped. I go to the post office twice a week- on Tuesdays and Fridays. In the event you have indicated a deadline or it is a rush order I can go to the post office or to FedEx if requested on other days as well. I have not been charging handling costs - all shipping costs have been only for the actual postage ( FedEx or USPS) plus the container cost. Postage has gone up once more. The $9.50 that has been charged for most packages of scarves to you does not quite cover the actual postage to many US destinations any longer. So shipping, unless a larger box or heavier weight, will now be $10.50 to continental states. This is not including any 'hidden' cost of time and gas to the post office which will continue as before of no charge. Note that FedEx charges are considerably higher than the post office, but that option remains if you want me to ship FedEx. I don't have a way to estimate FedEx costs so invoices using their services will be sent to you after your scarves are shipped. Otherwise all payment is due prior to shipping. If your product arrives damaged due to transit issues, contact the post office or FedEx with your tracking number. We will accept no liability in the event of loss or damage by mail carriers, messengers, or other delivery services. OUR PRODUCTS: In the event you want a refund, and the product is one of our designs, simply return the product within 30 days at your transit expense, and we will give you a refund of the amount you paid, less original shipping costs. CUSTOM ORDERS refunds and returns -Contact us prior to returning an item - refunds are at our discretion because custom orders are not refundable in general unless the product is defective. Custom orders are any printed from your design, not pre-printed from our design. First, return the item to us within 30 days. No refunds or corrections without return of the first printed item. REPRINTS. Let us know if you want it reprinted because of misunderstanding or mis-communication in size, fabric or other directions from you, and we will comply for cost of the fabric and ink and postage for the re-printed image. REFUNDS. Partial or total refunds (less shipping) will be issued upon receipt of the returned product. Refunds do not apply if the product was worn, became stained or soiled after its arrival, improperly cleaned, torn or otherwise damaged after arrival. Please note that any order returned, unclaimed (not shipped to you because incorrect or no address given) or unpaid, will be recycled after 30 days. This means the scarf or other printed item may be donated to charity or may be cut up and used for swatches/samples. By placing an order you understand your right to return items according to above policy. Occasionally I have inquires from non-profits, religious groups, and other good causes for special discounts. I am sorry I can’t offer deeper discounts for non-profits or other wonderful organizations. I have a couple methods on the Price page for the discounts I can offer, but prices are just about as low as I can go due to my costs. I am working on a tight budget and have to support myself first before deciding on others to support. While we recognize all art forms, including eroticism, we reserve the right to not print what is deemed obscene or pornographic in content; or any art conceived to be threatening, or inciting criminal or civil liability; or that infringes on the copyright ownership of another. We do keep copies of our email correspondence and your invoices from Paypal. We keep your mailing address on file in order to send your finished work to you, but do not share your email or your physical address or phone numbers with anyone else. We do not have a 'mailing list' for bulk emails for any purpose.